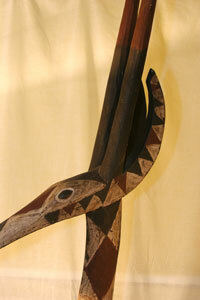 Comments: The Kurumba people produce a mask headdress in the form of an antelope. 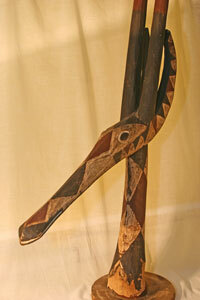 The powerful neck supports a head with a long pointed protruding snout. 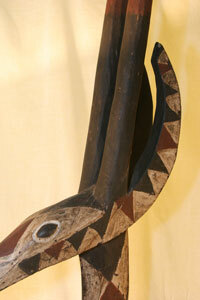 Earlier versions had large ears curving to the towering horns in a semi-circular fashion (echoing the curve of the chi wara mane of the Bamana). 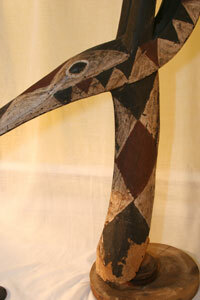 These earlier versions were fashioned with masks covering the face much like the masks of neighboring Dogon cultures. 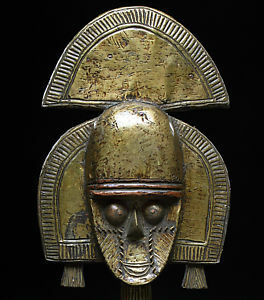 Pre-colonial styles were painted with geometric designs in natural pigments of white (kaolin), black (river mud or charcoal) and reddish brown (ochre) as are the Dogon masks. More recent styles have long sharp ears (many still curving towards the tall horns) and are colorfully painted with more distinct patterns of triangles in white, brownish-red, black, light blue and yellow ochre. As in the earlier models, the triangles are filled with rows of white dots. The horns are banded in stripes of the same colors (Wassing p. 182).